Uncategorized | The Pagan & the Pen ~ An Online Magazine! I received a phone call today from my mother that shocked me. To be honest, I’m still in a state of denial. And that’s just how I’m feeling. I can’t begin to imagine how my stepmom feels. Her brother Freddie was a truck driver, and one of the sweetest, greatest teddy bears I’ve ever known. They were very close as siblings, and Mama (stepmom is her partner of 20 years) loved Freddie like a brother. I felt close to him. Then again, everyone who knew Freddie felt a connection with him. He was open, loving, wouldn’t hurt a fly. He’d been through so much hell in his life, yet he managed to conquer his personal demons and became an inspiration. This morning… he passed away. According to the New York Highway Patrol, his rig veered off the road, hit trees, and a fuel tank exploded. They don’t know if Freddie had a heart attack, a stroke–whatever. There will be an autopsy, though, and then he’ll be cremated and his ashes scattered around blueberry bushes in Decatur, AL. Love your family–no matter how far they might be from you. I’ve been watching news out of India this past week about Swami Nithyananda and the scandal he and his organization are caught up in. Those have inspired this post. I am acquainted with Swami Nithyanada’s Life Bliss organization because they took over Hindu University near me in Florida. I’d been taking yoga classes with a wonderful instructor at the school before the takeover. Afterwards, the classes were offered by the Swami’s Life Bliss Foundation and included meditation and watching a video of the Swami’s teachings. Now I don’t have enough experience with Hinduism to comment on the teachings though there have been accusations that they were both borrowed from others and highly westernized. (I did have a bit of a confusing conversation with one organizer who insisted that the Swami’s teachings his organization were not actually Hindu because she didn’t believe in Hinduism.) But what finally made me reconsider the organization was the simple issue of money. Now, it is not that I believe that religious organizations should or can be completely free from monetary issues. Our local Wiccan Cooperative asks a small fee for rituals so they can help pay for space and supplies. And when I attended the meditation sessions, which were free, I didn’t object to donating money or supplies to help make sure we had tea and other minor needs for the meetings. But I do have a problem when I sense that any religious organization is using fees to make a profit or control who joins the group. And I soon began to sense that I was seeing an organization that had structured itself to attract Westerners willing purchase Spirituality to join the ranks while keeping the poor or money conscious at a distance. How? Well, while the basic meditation each week was free, the other programs that the foundation offered were not. And in fact, increased in costs during the period I was with the group. At weekly mediation session, we were often encouraged to sign up for the more expensive programs, which involved multiple levels all increasing in cost. Then there were the talks given by the Swami during his travels, which often required a fee for attendance. It seemed that again and again after the meditation sessions people would sit around discussing what program or talk they wanted to attend and what the cost was. When asked about the increases in price, the organization responded that the Swami had become so popular they needed to raise prices to ensure space for true devotees. Huh? Now, I spent years working in the tourist industry. When you set a price point for entry to a theme park or a room at a resort, what you are doing is actually selecting the level income you want your guests to have. Why? Because this level of income will also determine the amount of money they spend on merchandise, food and other items that well, frankly are a large portion of your profit. So, when a religious or spiritual organization that sells books, CDs and other paraphernalia sets a price point for admission, my wisdom tells me that they’re looking for members with money that can be spent on programs and merchandise. Currently many in India are angry over the way such actions are influencing people’s perceptions of what Hinduism is. As Western Pagan, we can learn from this. We are avid readers and love to buy books. We often take classes from local experts in everything from Wicca to tarot reading. And then there are items for the altar, sacred jewelry, scented oils, candles, and such that we love to buy. All of this is fine, as long as we remember – no one can sell us spirituality or enlightenment or the Goddess. The connection to the God and Goddess lies within each of us, and they don’t charge an admission fee. 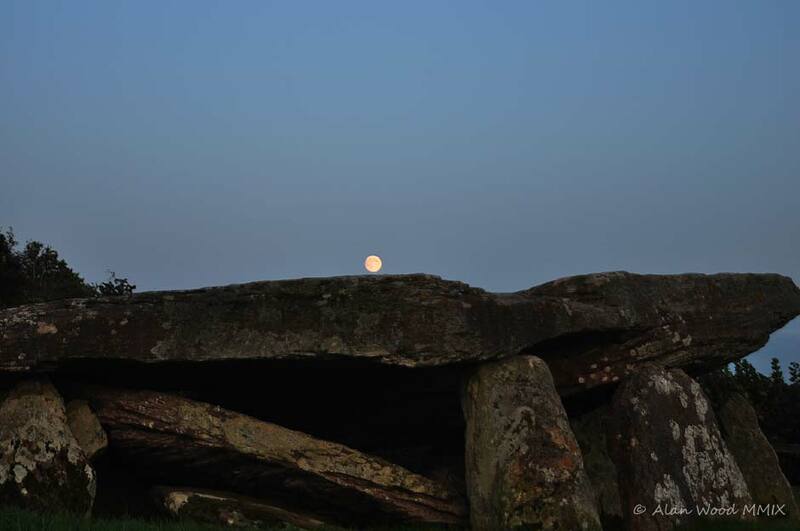 Nuin, the Ash tree, has its Ogham moon from 18 Feb – 17 Mar. This picture from Wilson’s almanac gives you some good reference points to identify it. the lower picture is of a most impressive ash tree at Brannbolstad, with a 4.7m girth, that I found on the Woodland Trust site. Ash is the tree of rebirth. It is also the tree of Gwydion who is the master enchanter of Britain. Rebirth is about regeneration, revival, a new start or beginning, revival, resurgence, reawakening. Resurgence is especially interesting as it comes from the word “surge” meaning to gush, pour forth, rise, well up, spill over and such, and rebirth can involve all of these. 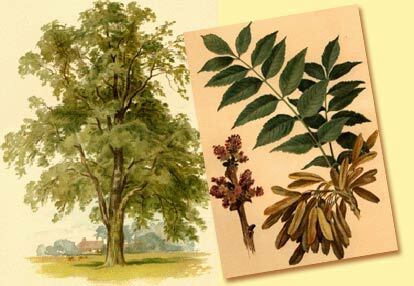 The great ash tree, Yggdrasil, of the Nordic tradition is also the World Tree. It is sacred to Odin, as well as Gwydion, and used as Odin’s steed. The 3 Norns of the Scandinavian traditions – who are also another face of the Triple Goddess – dispensed justice under the ash tree. In Greece the ash was sacred to Poseidon, god of the sea, ocean, earthquakes and horses. In Wales and Ireland all oars and coracle slats were made of ash to protect against drowning. Ash is also the very best wood for making a fire. In it’s fire role, ash is a creator/destroyer tree, a tree that carries the essence of “power” – that part of the Triskele that is the life-spark. Note too … its name is ASH … the result of burning … what does this tell you? 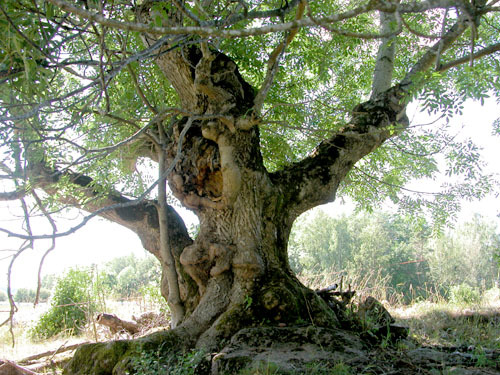 Ash is a transmutation tree, helping us walk across the worlds. This is one of the reasons ash is often used as the wood for all the ogham staves, to help the user walk between worlds. Hello to all Pagan and Pen readers…Erin Sinclair here with two new questions and an article about the Tulsa Psychic Fair. First query is from a man who has run a successful business for some time now, but started over from scratch a year and a half ago after a huge corporate shake-up within his firm. Now he’s narrowed down his focus to one specific type of practice and asks about how to harness new energy for its success. RLR, thank you for your question. It seems that everyone is concerned about career growth especially in this economy. You mention you’re a Christian and a man of science in the same sentence. I find this intriguing as I sincerely believe that science and spirituality go hand in hand, each lifting and supporting the other. When there is balance in this approach I find one experiences the wonders of the universe with an inherent sense of responsibility toward discovery and the innate “magic” such a search can bring to the seeker. With that stated, your cards pulled as follows: The ‘9’ card-upright Mastery (The Chariot); your first initial-upright King of Swords; your second initial-upright Queen of Swords; and your third intial-upright The Close (Death). The Mastery card tells me without doubt you have made the correct decision in changing the direction and focus of your business. As it vibrates to the number ‘7’, a number representative of marching to the beat of your own drum as well as victory after a struggle, this was not an easy task for you, but ultimately, after a hard fight, triumph was yours. You do not indicate exactly what happen for you to make such dramatic changes to your company, however, my sense is (due to the influence of the Sword cards pulled) you found your former circumstances completely unacceptable to your continued growth. Literally and figuratively, you cut the wheat from the chaff so to speak and terminated business contacts not conducive to your expansion, eliminated employees who were more hangers-on than helpers, even changing your business address to put a new face on the new direction you decided boded well for future success. The Mastery card is indicative of having faith in oneself, so do not allow your enthusiasm for your new approach to lag, you have the power around you now to gather in the energy and focus it into a powerful force to use toward your success. This card also indicates you are a person who likes being in the driver’s seat and to exert control over any given situation. Your motivation comes from your questioning mind and your well-developed will power. Keep on driving, your vehicle is well equipped and will provide for you. However, the team that is pulling you toward your goals and aspirations can only be controlled through will power. This is a dangerous place to be in, for you are working with fellow human beings to support your dreams of a golden future. Be sure to give them the respect and kudos they deserve for the quality employees you believe them to be. If you micro-manage every single aspect of your business, you could very well create blocking energy that will ultimately manifest in negativity and that is not the key to growth. The King and Queen of Swords strongly indicate to me that they represent you and a trusted employee who has been with you for a long time. You are a no-nonsense man who wants what he wants and wants it NOW. The Queen feels overwhelmingly like a female manager who knows how to work with your temperament, your desires, your wants and business needs. She is as mentally acute as you are, so count yourself lucky you have this individual in your corner for The Queen of Swords is no one to trifle with…be good to her and she will reward you in kind with stellar skills and protection when you need it most as she thinks just like you do. Mistreat or undervalue her and you could very well find yourself in an audit with the IRS, as an angry queen is a dangerous creature, LOL! The third card, The Close, is telling me there are HUGE changes ahead for your company. Because it is upright, this feels exciting, daunting, but overall a good thing. At this juncture, keep your mind open to possibility and be flexible. Your new enterprise still needs trimming and whittling in order to become the smooth, efficient machine you want it to be. I realize you’ve recently moved, but there is a strong possibility of moving once again. I take this to indicate your new venture becomes so successful you are able, for example, to buy your own office building instead of leasing space in one. Good luck in your future adventure! Our next querent states she has recently taken the chance to branch out into the field of self-employment. She would like to know if this was a wise decision, as it is in the field of real estate in California. I give her kudos for attempting to become self-employed, most especially in a field that has been so battered by the housing downturn. Dear HAW, Man, when I first read this I felt this blanket of “sorrow” cover me. It must have been so difficult and so scary being in your situation. I, too, was the victim of a blown real estate market. I’m still hurting over what happened to my former home, but things change and the best one can do is roll with the punches. I thought long about the spread I pulled for you and I felt two things. The first, a sense of loss on many levels, the second, a sensation of many beings stating in one voice…it’s about time! My thought on the latter is you are in a great career field for your lifestyle as it will give you much needed independence and flexibility. My strong impression is despite the market you will do well, you just need to give it time and don’t bite off more than you can chew. The cards seem to reflect this as your ‘9’ card is the upright Six of Swords, your first initial is the upright Seven of Pentacles, your second initial is the reversed Page of Pentacles and your third initial is the upright Ten of Rods. The Six of Swords tells me you are moving from a bad situation to a good one, from more challenging to more peaceful times. Spirit is definitely guiding you at this time, your mind and soul are one and listening to one another clearly. You are finally seeing things as they really are and not the way you would like them to be. In other words, you tried going corporate because that was what you were supposed to do. One day you decided to do what you wanted to do. Good for you! The Six of Swords is also known as the healing card. You are now on the way to healing from the burdensome mental stress you’ve been under. Breathe and look forward to new beginnings. Intriguingly enough, the ‘6’ vibration is all about karmic sowing, so plant your garden and tend it with care, abundance will be yours. The Seven of Pentacles (I’m sensing a theme here, lots of ‘7’ energy in these readings, victories after a struggle). This is representative of a period of waiting, of not knowing how a matter will manifest itself. You will need to be patient in this new venture for it will take time to build a clientele, connections, plus you are contending with the current market. Be careful financially (again, remember, karmic sowing). Now, bear in mind that doesn’t mean that you will not receive the rewards of what you have worked for, just realize success will come with patience and responsibility. This card is here to remind you not to make any major financial decisions at this time, keep your hard-earned dollars close and don’t spend frivolously. The reversed Page of Pentacles is telling me you may have trouble with bureaucracy in some way, whether it be with your licensure or paperwork regarding a sale. Just make sure every ‘t’ is crossed and ‘i’ is dotted and all is as it needs to be. The final card gives me pause because my first reaction to it is you tend to take on too much. Perhaps you feel the need to be in control to give you a sense of security, perhaps you don’t know how to say ‘no’ for fear of hurting someone’s feelings. The Ten of Rods upright is indicative of self-oppression or withholding communication for fear of how it will be received. There’s always a way to communicate, sometimes you just have to be blunt. There’s a time for diplomacy and there’s a time for in your face honesty. Use your best judgment. While it is true you catch more flies with honey than with vinegar, sometimes it’s just not worth all the flies, I say. It is also indicative of taking on too many things at once. I’m sensing this is a consistent sort of behavior for you. Give yourself a break and start re-orienting life around your needs and with others demands on you. The word ‘no’ is not a bad word at the appropriate time. The fact that the Ten of Rods is the outcome card in your spread shows that you will persevere in spite of difficulties, burdens or financial problems. You will succeed as a realtor, you will resolve and complete all issues your long-term unemployment brought into your life and your new venture will ease much of the previous tension you have been dealing with for so long! I send you positive energy for this new path you are on, HAW! That’s all for the readings this month everyone! Now, I’d like to tell you about a neat little psychic fair I attended in my new home state of Oklahoma. It was held at the Sheraton Select in Tulsa on February 27 and 28, 2010. I’ve been to a few psychic fairs and as fairs go it was rather small, but fun. At this particular event, there were jewelry makers, stone sellers, bookstore owners, tarot readers, artists. There were a couple of organic herbal marketers as well as an organic make-up business woman. There were some cool spirit artists. There was one woman who played with digital photography mixed into acrylic paintings. A rainbow spectrum of color played out on every piece. It was a unique approach to painting that I enjoyed. There was a Kirlian photographer there who captured auras. The results were fascinating. Everyone appeared to have billowing mists of color flowing around them, some whose hues were pronounced and intense, others’ colors muted and soft, like a gentle spring rain. She even took photos of participants’ companion pets. The animal energy looked “happy”, big bubbling clouds of lavenders and pinks, blues and white. I have to say though, the best part for me was the billet readings by Cyndy Green. She was amazing. For those of you not familiar with billet readings, the basic gist of the event is you write a close ended question or two on a 3X5 piece of paper. You can ask your guides, masters, teachers, those loved ones who have crossed over to assist you in answering your questions. Fold it over, hold it between your palms and concentrate on the questions. In Cyndy’s case, she tapes her eyes shut, then blindfolds herself. She begins to sing to music that puts her in a meditative trance. All of the billets are collected and brought to her in a covered box. She starts picking up the billets and rubs them in her hands, on her crown and 3rd eye chakra. Her spirit guide, Tidbit, assists her as well as the guides and spirits who people have called upon to answer their questions. They step into the room and provide her the answers querents’ seek. THIS WOMAN IS AMAZING, rightly announcing names, facts, descriptions of those who had crossed over and were now in the room. I wrote two questions down. One was closed ended and specific…will I be attending college by the summer of 2010, followed by an open-ended question…spirit what do I need to know at this time to help guide me on my path? Cyndy did not come to me directly, but spirit works in strange and wonderful ways. I was told via other participants’ readings every single thing I needed to know in very specific detail. One young woman was informed the only one keeping her from going to school was her, that it was time to return and her decision to return to school was based on the false belief funds were not available. She was informed to just go for it because the money would be there for her to attend. The receiver sheepishly nodded her head but didn’t seem as impressed by the message as I did. I felt strongly that message was intended for me. The next querent was advised that a spirit who tends to animal spirits wanted to let her know that “all the babies were fine, doggie heaven is great and he’s being well-tended.” My 9 1/2 year old beagle Charlie passed away last month after a brief but severe illness. I was absolutely heartbroken and inconsolable for a week, so much so, that my boss let me go home because he felt sorry for me as I tried to hide my tears from him. The guilt I have been feeling that I could have done more for him was huge. I felt as if I betrayed him and all the unconditional love he had give me over the years. Then this nice lady, said “the babies are all okay”. I received an electric shock of the familiar. I call my dogs “babies” all the time, i.e., come on my babies time for dinner, come on babies let’s go inside. Coincidence? Could be, but then she stated “everything has a time to live and a time to die, it is nature and the way of things. Do not feel guilty at his passing, it was simply his time and all is well with him. He is happy, healthy and running through green fields. My sorrow lifted. Charlie loved to run. He was a beautiful, sleek dog whose favorite thing to do when he was a pup was to run and run. I have no doubt now he is surrounded by love in his new home, just as he was when he was in my home. The next message I received was with regard to my relationship with my children. She stated no matter what is said, no matter how they come at you, stand your ground in love. Never waiver from that and words and deeds will cause no harm. When they recognize they are loved and you are coming to them in love, they’ll accept that love and all will be well. There were a couple of other messages, a little too personal to state here, but I just have to say I left feeling assuaged and uplifted by the energy that came to me during the experience. I am a practicing medium/psychic, there were so many spirits in the room that day, in so many different shapes, sizes and spectral colors, the whole room seem to vibrate with the energy. Here’s her website for those who are curious- http://www.cyndysangelmessages.com/ . Until next month folks! Remember, never forget to give yourself the opportunity to explore the unlimited possibilities of the universe! What does being an urban pagan mean to me? I honestly can’t say, because I’d only lived in the city for 18 months before moving to a rural area again. At the time I lived in the city, I was so far into the broom closet, I was practically in the neighbor’s apartment. I did find having access to many books through a very large library system exhilarating, particularly since – at the time – the rural library I was a member of wasn’t able to put anything but books on Christianity on the shelves. A few years after I came out here, I exited the closet and became very public and very vocal. That didn’t sit well, more so with the urbans than the rurals. Who was “I” to speak for “them?” I wasn’t planning on speaking for them, I was speaking for myself and my grove and our choices. I would not think to speak for others when they have voices of their own. I have a long-standing dislike for city pagans in my area. Not all of them, I suppose, but having been looked on as a country bumpkin, a know-nothing nobody, an interloper (yes, that word was actually used when I began organizing non-urban festivals and open circles) and not taken seriously simply because I choose to live outside of the city by their majority, I have cut all ties to them. It’s not for lack of trying to participate. In 1999, I attended an open to the public event for Beltaine, and my companion and I were totally ignored by the ‘regulars,’ approached only by other folks who were new. When it seemed as though only a small handful of people were going to step up to help dismantle the Maypole, my companion and I stepped up and helped. I should say – attempted – to help. Within five seconds of our approach to the pole, laying our hands on it to help steady it as it was brought down, a woman I came to know as part of the circle of disdain screeched that we should not be allowed to touch the pole. I’ve never attended that particular event again. I did try to become involved after I signed on with Pagan Pride in 2000. We invited city folks out to meet with us, and their immediate reaction was contempt, and a demand that we allow them to make decisions and have the initial event in the city. We refused politely, and most of us were snubbed from then on. A couple of us went out of our way to attend circles and gatherings in the city, only to be turned away at the door. Our group held our event to the constant complaints of the city people who demanded that the next one be held in the city, and several of our members were ripped off by ordering items from the city vendors which were never produced later on, and no refunds were given or even offered. The pot-luck dinner was scorned by them, and they brought in their own meals from Subway. The non-perishable food donation (which DID go to THEIR food bank) had five items from those seventy-five people. The rest of the items were from our group alone. At our last event, I refunded table rental money to two vendors because we’d ended up boycotted (I refused to move an event meant for local people to the city, and was then told no one would come out) and only fifty or so people from the local towns came out. At one point, after having been scammed out of money I couldn’t afford to support a group in the city that hosted a national gathering (I purchased fundraiser items that were never sent), I very nearly cut ties with everything pagan except my group and my family. Those city people were in fact the main reason I left Pagan Pride in 2007 (yes, there were other reasons). When I was verbally assaulted by a member of the planning committee for that national gathering over whether or not I (at the time I was the national director for Canada) should be on a panel specifically for Pagan Pride, that was it. I got tired of trying to fit in with them, of trying to change myself to suit them, of even making an attempt at being civil. Recently, I realized I’d set myself to ‘no-mail’ on all the pagan groups I belonged to, except two which are run by pagan elders in the US. When I had to change my mailing address, I unsubscribed from all of them. I’d been on no-mail for at least two years, and hadn’t missed a thing. Sadly, my encounters with the urbans have soured me – as if that wasn’t obvious – and I have made the conscious decision to not mingle outside of our group anymore, at least offline. Should we have any interaction with other pagans, it’s usually those that are also in our area, most of whom have also experienced what we have. This works for us; we’re rural, and we like it, ladybugs, big bonfires, green grass and all. Please consider helping to support The New Bedlam Project by checking out a list of gently used pagan books for sale on my blog: Downsizing to Your Benefit? Jodi Lee is publisher and editor in chief of Belfire Press and The New Bedlam Project. Her writing has appeared in several recent anthologies as well as magazines on and offline for the past decade. Having shelved her first novel for the time being, she is currently working on two novels set in the fictional town of New Bedlam. 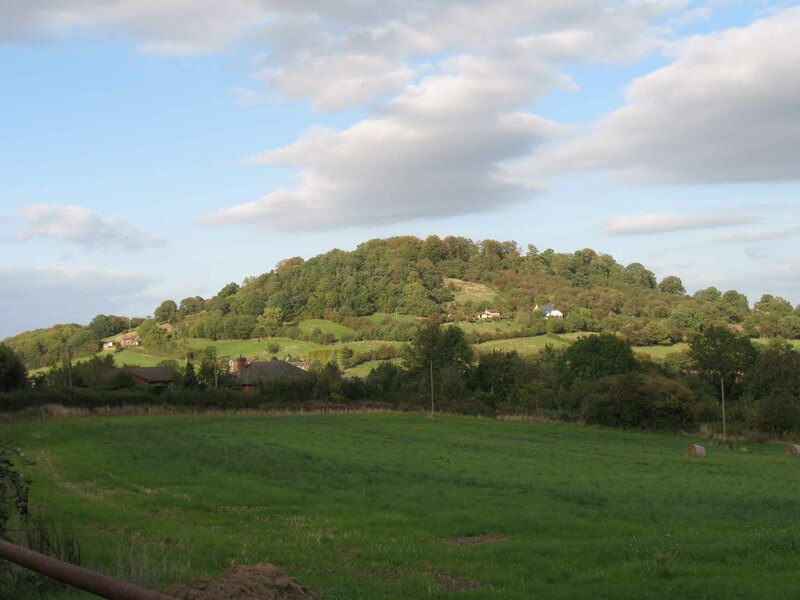 We’re going to work at 2 nearby sacred sites that I love – Arthur’s Stone and Dinedor. Arthur’s Stone is a very magical place, about 4-5 thousand yrs old. The work will include going into the tumulus to journey and coming out new. At Dinedor, when building a bypass around Hereford, they found a 4000 yr old serpent way similar to the one in Ohio. Unfortunately, the near-sighted council didn’t press to open this up and make it possible for people – from all over the world – to visit it but buried it again! You can’t see it but you can feel it. We will be asking the Serpent to help us in our alchemical journey. This will be an experiential and exciting workshop. Frost but no fire as yet. One of the Norse world-creators is very definitely with us but not the other. The world outside is covered in a sugaring of frost, delicate, ethereal. I think I shall be glad when the fire comes … but it won’t be quite yet. There are snowdrops budding outside the front door but not daring to come out in flower yet. Will they come for tomorrow? 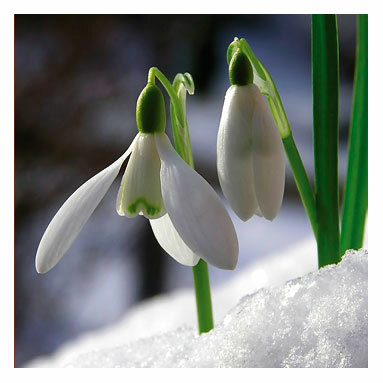 I’ll bring 3 buds in later to celebrate her – snowdrops are Brighid’s flower. We call her Fraide here in the Welsh Marches, in the Brythonic tongue, but we still know her three faces – Maiden, Mother, Crone. This is the time the maiden comes to the well and asks the crone for a drink. The crone tries to stop her but the maiden wins out … so spring is born again out of winter. I wonder if she does herald the change, this year, from the ice of winter into the fire of spring? we’ll see what the weather brings next week. We’ve had a good, hard winter enabling lots of work and change to happen within the Earth. It’s been a wake-up call to us humans too, the planet is much larger, stronger, older and more experienced than we. And she’s a wise Mother, not wrapping us in cotton wool but helping us experience hardship, making us re-learn to choose. I watched Mervyn King, the governor of the Bank of England, in a treasury committee last night, it was good. One thing that stood out for me was when he said we had to make a cultural change, go away from the idea that there should be no risk, stop believeing that if we made a bad choice we would be bailed out. Yes, Mr King, yes indeed. This is something the shaman knows – there is no life without risk. Modern western culture tries so hard to eliminate all risk, to make sure “bad things” can never happen, never again! During the snow, there were people actually asking how we could stop bad winters happening! Unbelieveably childish. Life isn’t like that. Risk, pain, hardship are vital to growth – they are part of change. This hard winter has been part of the planet’s way of telling us this, that our bay-ways of no pain, no risk, “happily ever after” are unreal, impossible and even bad for us. Fraide/Brighid, the foster-mother, will give us experiences to help us grow … and these won’t always be “love-n-light”. One of her faces is the Blacksmith, the forger of metal. The Blacksmith will forge us into stregnth even if we are kicking and screaming all the way *g*. All hail the Lady of Spring.